Outpatient surgical volume now represents the majority of all surgeries performed in the United States with approximately two in every three procedures taking place in an ASC setting. As CMS increasingly places cost constraints on hospital inpatient care through readmission penalties, patient satisfaction requirements, and a stronger focus on medical necessity the desire for growth in outpatient services will only increase. 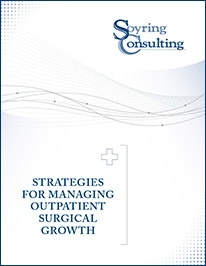 This, coupled with expanded outpatient reimbursement and innovations in surgical techniques and medical devices, allows for increasingly complex procedures in outpatient environments.